The first time you try out the DeMarini Black Ops Roller Bag, it’s just plain special. It’s just about perfect, but that’s also what’s wrong with it. It’s like riding in an opulent Rolls Royce for a week and getting used to all that luxury. The problem is when you have to get back to your old rust bucket when you’re done and back in the real world. Nothing will ever suffice again. It’s a good thing that at least the DeMarini Black Ops Bag is a great deal more affordable than a Rolls Royce! What is the DeMarini Black Ops Bag? It’s a bag that you use to carry baseball equipment. That’s essentially what it is, but then that’s like saying a Rolls Royce limo is a car. So saying that the DeMarini Black Ops Wheeled Bag is just a bag is an understatement of historic proportions. First you need to take a good long look at it. It’s available in several colors, including black, charcoal, and navy. These colors are subtle and very professional-looking, and you can say the same about the overall design of the DeMarini Special Ops Wheeled Bag. It’s like something that the MLB pros will use. How Much Room is in This Bag? This thing sure is roomy. It’s more than enough for your baseball equipment. That’s the problem with baseball, right? It involves too many items such as bats, gloves, uniforms, cleats, various paraphernalia, and what not. But this bag measures 38.5 inches long, 15 inches wide, and 12 inches high. It gives you as much as 6,700 cubic inches of room. That’s about the same as having enough room for 30 gallons of water. This isn’t just one huge bag either. It comes with numerous compartments specifically designed for particular items. These compartments are designed to accommodate weird shapes like bats and gloves, and they’re separated so they don’t jostle and damage one another. 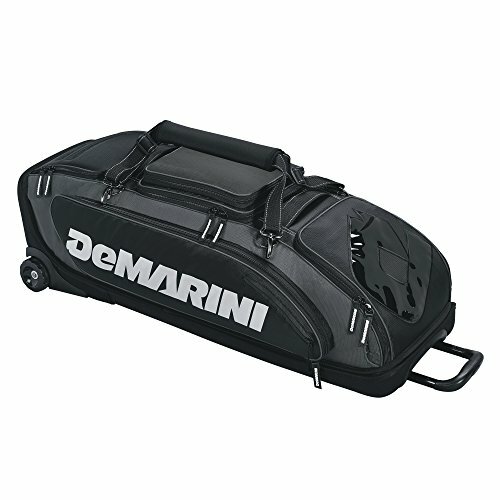 Various DeMarini Black Ops Wheeled Bag reviews have commented on how fun it is to discover so many different compartments. A thorough check will reveal as many as 21 different compartments. One of these compartments is specially designed to hold up to 4 to 7 bats that measure up to 34 inches long. The spaces for the bats keep them from moving around so they don’t get warped. In fact, the compartment is even armored, so that the bats are truly protected just in case someone puts a heavy bag on top of this one. Each bat sleeve is also padded. Can I Also Put Cleats and Gloves in This Bag? The compartment for your cleats is breathable, so that you don’t get a nasty stench inside. This compartment can even be detached so you can wash it off after you use it. That makes it easier to get rid of any dirt inside. There’s a huge central compartment where you can also put your gloves and other pieces of gear. Don’t worry about the space—it’s the size of a regular laundry basket. Everyone has smartphones these days, and this bag has a special compartment for that mobile device. You can put your smartphone here when you’re playing or practicing. It’s particularly nice since it’s lined with fleece so the screen won’t get scratched. Other compartments on the side can be used for other stuff like car keys, wallets, and other personal items. The compartments have their own protective features, and they’re adjustable too. So your items will remain securely in their compartments and they won’t get damaged. That includes items like your gloves. Will This Bag Protect My Gear? This comes with a hard body construction. This is important since sometimes athletes can forget themselves and sit on their baseball bags when they’re waiting around. So if you have a soft bag, the things inside can get messed up by the weight. Bags may also be piled up without damaging the equipment. You can easily pull this along with you. It comes with a telescoping handle that’s nice and comfy to hold. The custom wheels are very sturdy and rugged, so you can roll this over even floors or uneven playing surfaces. The wheels roll very smoothly, even if you use this up and down stairs. This comes with neoprene straps that you can attach or remove depending on whether you want to carry the bag. The straps are certainly durable and of high quality. You can say the same of the whole bag, including the various snaps and zippers. These things, little though they may seem, won’t break and cause you grievance. When you’re playing or practicing, you can just hang this on a fence. You can do this much more effectively because the bag has double-sided fence claws that can bear the weight of the bag. When you’re not hanging the bag, you can tuck these claws away. The overall look is undoubtedly very professional, and the color options certainly help. But there’s also a removable decoration panel that can fit an 18-inch hoop. This allows you to customize the look of the bag so it can denote your team colors and logo. Here are some very good reasons why you’d want to use a bag like this. It’s very professional-looking. This isn’t as irrelevant as it may seem, and it’s not about vanity. Having this along with you makes you feel like a pro, and it helps you take the game and practices more seriously. This isn’t a casual bag for casual players. It’s what you want to use when you’re serious about the game and about playing your best. It has room for all your stuff. Nowadays even non-baseball players need to bring along too many items. So where will you put your car keys, wallets, smartphones, wristwatches, rings, ear buds, and whatever else? This bag has compartments for all these items. Not to mention that it also has space for baseball equipment too. There’s no need to worry about where you will put all your gear. This bag has room and compartments for everything you will need to play the game. Will It Keep My Bats and Gloves Protected? It also protects all your gear. That’s the main problem with using ordinary backpacks and bags for baseball equipment. Your items can be damaged very easily. But the specially designed compartments and the hard body construct will protect all your items. This even protects your gear from the rain. Your gloves and bats won’t get scratched, and you won’t have to worry about your smartphone and wristwatch either. It also works very well as a travel bag. It rolls very easily and smoothly regardless of the surface. The design of the pull handle allows you to bring this and maneuver this very easily. The wheels turn and go wherever you go. If you want to just carry it, you can do that too. The straps are very comfortable to handle. It’s also very well made. Bags can be annoyingly fragile, with compartments that can tear and zippers that can fail. These things can be very frustrating. But the DeMarini Black Ops Roller Bag isn’t like that at all. You’ll find very few DeMarini Black Ops Wheeled Bag reviews that will mention such failings. So what’s the catch? Well, there’s just one hiccup—it’s a bit expensive at about $200. Remember what we said about how the DeMarini Black Ops Wheeled Bag is like a Rolls Royce? Well, the Rolls Royce isn’t exactly cheap either. But then again, when you consider the benefits the $200 isn’t much. You can enjoy the advantages it offers for many years. Considering the cost of bats and gloves these days, this DeMarini Black Ops Bag seems like a wise investment to protect your equipment. Is it worth $200? The answer is an unequivocal yes. There’s a reason why this is a great favorite among players who travel a lot on buses and planes. If you’re an older player (high school or older), then it’s great. It’s just about perfect. Take this with you and you’ll somehow feel like a pro. Baseball is all about feelings and being confidence and this can provide you with that “pro” feeling that can help you play much better. It’s not just a bag. The DeMarini Black Ops Roller Bag is a baseball bag, and it deserves its place in every player’s closet. It may also seem pretentious at first, and it may feel like you’re not that good enough of a player for a bag like this. But that’s only at the start. This can encourage you to play better and to take the game more seriously so that you do indeed become better. You may not feel like you deserve this bag, but it can encourage you to try to deserve it. So get the DeMarini Black Ops Roller Bag, travel in style, and become a better player in the bargain! See This DeMarini Bag on SALE TODAY.